We have seen in the recent past the heat on the FTA with Singapore that was signed around nine months back. Whilst there can be merits to this argument, we have to keep in mind that when a country is struggling at 3% GDP growth and a debt stock that is stacking up due to currency depreciation, we have no option but pursue an FTA/economic partnership-driven growth agenda just like many countries have pursued globally. To be specific, Bangladesh, Indonesia, Vietnam and Mexico are classic examples in today’s world where due to economic woes were pushed into opening their economies to the world and today they are trailblazers. If one tracks back to each of the countries mentioned above, when the decision was taken to ‘connect to the world’ with economic partnership, there was agitation. But, once the benefits started kicking into the system, things settle. It will be interesting to see the independent report that will be presented by respected economist W.D. Lakshman to the President on the FTA with Singapore. Given the democratic model at play, when a Coalition Government is running the country it leads to a very strong share of voice on media on issues such as ‘opening the economy to the world’ that upsets even the diplomatic relations of the two countries that have signed the very agreement. We saw this on the Indo-Lanka FTA 15 years back and now we are seeing history being repeated on the FTA with Singapore. The bone of contention that the private sector has on FTAs is because, the Indo-Lanka FTA with India even after 15 years is not performing up to standard with just a 0.5-1.0 billion dollars in exports from the Sri Lankan end. This comes in the backdrop of the booming opportunity in India of the middle class customer base of over 400 million. The key strategic sectors of apparel and tea are struggling with the FTA utilisation below 20%. Some companies who have ventured out in the confectionery business have got burnt without any light at the end of the tunnel, which ultimately led to the Sri Lankan chambers issuing a statement that until the FTA anomalies are corrected Sri Lanka must not purse the ETCA economic partnership agreement. There has been many conferences to iron out the issues but now the key issues happen to be more of political nature than being trade centric. India’s view on the status quo is slightly different. They believe that the anomalies of the current Indo-Lanka FTA will be corrected when ECTA is implemented. In my view, in fairness to Sri Lanka exporters we have to see some course correction on the current trade agreement before we ink new trade linkage. The logic being that we need to see the political will for change before the private sector invests money to drive business. 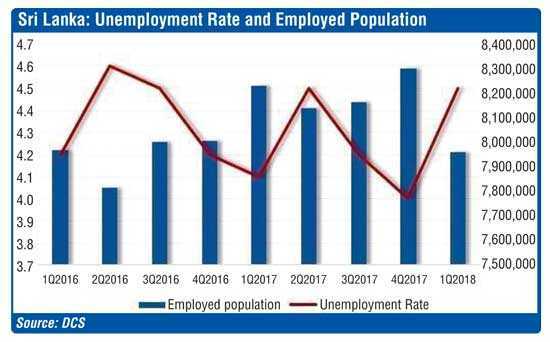 Whilst many are focusing on the demand side policy changes, the core issue in Sri Lanka that needs to be focused is the current unemployment rate of 4.5% up from the 2017 number of 4.1%. This number of 4.5% means that technically Sri Lanka has a people issue on the 83 billion dollar economy. A point to note is that in the last seven years we have seen how the employment at the public sector end has gone down from 15% to 14% as per the Central Bank Annual reports. On the other hand those employed in the private sector had increased from 40% to 44% as at Q1, 2018 which is positive. Given the fact that Sri Lanka’s unemployment is at 4.5% the key question to ask is, how can we move exports from 11.3 billion to 28 billion dollars as per the target set by the National Export Strategy launched recently by the Prime Minister? Even if the current export revenue takes into account the construction exports, etc. and the total comes to around 15 billion dollars, Sri Lanka will need to import people to fill the gap. In my view construction and apparel sectors, etc. can absorb imported human capital but the tourism industry must maintain the Sri Lankan hospitality rhythm. If this key policy decision is not taken on this front, we in the tourism industry will lose the identity and high satisfaction scores we currently clock in. The best case in point is a popular restaurant down Flower Road which employs Indian staff and I wonder how the customer perception is given that foreign visitors would like to have touch and feel of Sri Lankan hospitality. This argument might hold ground in the BPO/IT sector too, if there is some human interaction with international customers. One the skill gap argument, the point to note is that there will have to be a policy change which includes visa regulations which means reforms on employment that will need Parliament approval. 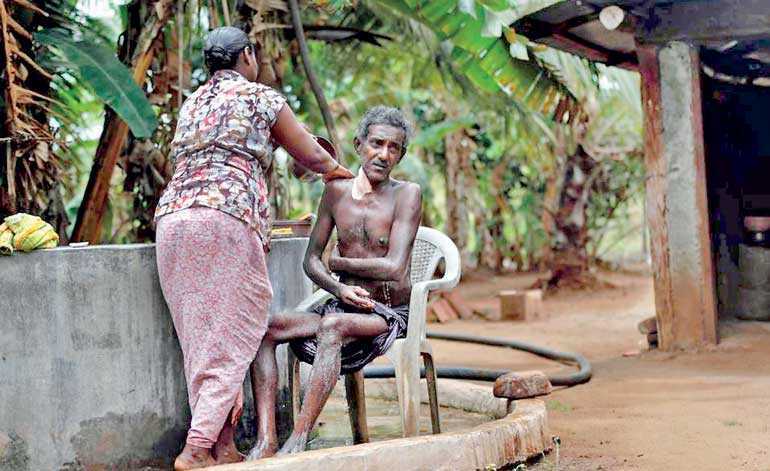 This will be a political nightmare given the year of elections coming to play in Sri Lanka in 2019 and 2020. Hence we see Sri Lanka is in a catch 22 situation. An interesting parallel was seen from a similar country, Mexico, which was also struggling with industrial unrest, low GDP growth and unstable political climate. Mexico has a population of 127 million and poverty and crime are burning issues of the country. In the 1990s the export income was similar to Sri Lanka with many supply chain issues and exports being in the lower spectrum of the value chain. The country was fighting for political reform to make it competitive whilst debt issues were prevalent just like any other developing third world country. Mexico had no option just like Sri Lanka in the 1990s where the country had to integrate the world and drive up the value chain on exports. Typically a country’s development agenda moves from exporting apparel to machinery and then to electronic components. Mexico was at the first stage of growth and it took the hard decision to move to an FTA driven growth agenda. A strategic objective that was not explicitly said was to reduce the dependency on the US economy. As at 2018, Mexico has 11 FTAs covering 46 countries that includes the geographic belt of US, Canada, Chile, Colombia, Costa Rica, Nicaragua, Peru, Guatemala, Honduras whilst from the rest of the world EU, Israel, Japan and made the country 1.1 trillion dollar economy with exports crossing 406 billion dollars which has come about from driving and reform agenda which was hurtful initially but the benefits started coming in over time. Between 1994 and 2016, Mexico’s drive on exports increased from $60.8 billion to $374 billion at a growth of 515%. Even though the current trade deficit is at $13.2 billion what is important is the quality of the export basket. From motor vehicles, motor vehicle parts, automatic data processing, electronic integrated circuits to electronic apparatus for telephones indicate how the nation has moved from apparel production to machinery exports and now at the higher stage of the value chain with electronic items. Sri Lanka on the other hand is yet at the stage of apparel dominating the export basket. Hence we see the leapfrogging that Sri Lanka will require, if we are to be competitive. Whilst the EDB must be congratulated for launching the National Export Strategy, the fact of the matter is that we should have had this in place by mid-2016 given that the new Government came to play in January 2015. Whilst the target of $28 billion set by the Prime Minister is commendable the reality is that to add almost 12-13 billion dollars when the unemployment level is at 4.5% means that radical reforms will have to be implemented. This to be actioned in an election year will be absolute challenge. Even if we implement changes to employment and overcome the issue by bringing down people from Bangladesh and China the question is, how can average export growth of 7% in the last five years be moved to 10% during the period 2018-2022? This comes in the backdrop of a 6.7% export growth in the first five months of 2018 means that the target set is a stretched number. When I took over as Chairman EDB in 2005 I yet remember advice of the outgoing Chair, the great Sivaratnam, who said: “Son, Sri Lanka has a supply chain issue and not demand.” I yet feel this argument holds ground. Coming from a private sector background, I am optimistic and I support the export agenda but, if we do not invest on R&D from the current 0.1% to around 2% of GDP we will not be able to compete with global players. We will not be able to move to the machinery and electronic export trajectory all countries like Thailand, Vietnam and South Korea have done. By the way South Korea invests around 4% of GDP to R&D to keep the country competitive. Whilst we accept the challenges in the Sri Lankan economy, we have no option but move to an FTA driven economic strategy just like Mexico and Bangladesh. The low GDP growth, high debt, consumer consumption contracting six quarters in a row( from 2017) up today at -14.5% in the last quarter whilst the $ crossing 162 means radical changes will have to be done. The million dollar question is, can the current administration do this task given the poor performance in the last three years?